Congratulations to "Jo-Anne", the winner in Ann's giveaway. Thank you to all who participated! People often ask me where I get the ideas for my books. I know this isn’t an uncommon question and I’ve wondered the same thing about books I’ve read. The real answer is: from everywhere. That includes dreams, news items, my imagination, word-triggers, and real-life events. In the case of First Star, it was the latter. Years ago, I worked in the District Attorney’s Victim/Witness Program. One of the case files that came across my desk concerned a local real estate agent. A man had become infatuated with her via her picture in her homes-for-sale ads, so infatuated, in fact, that he began to stalk her. The case made local news and intrigued my always active imagination. In my writer’s mind, I knew there was a book in there somewhere, but of course, my stalker would have to be a lot more threatening than the real-life stalker, who pretty much stuck to peeping from a perch in a tree and leaving innocent (to his mind) little gifts for his victim. The thing is, I like to have a lot of things going on in my books, so First Star couldn’t simply be about a woman in jeopardy. First and foremost, my female protagonist (Alex) had to have a love interest, whether she wanted one or not. Her love interest (Kell) had to go unwillingly into the relationship, whether he wanted to or not. And then there was the fact that Alex, twenty-five years later, is still grieving the loss of her twin sister. As you have guessed, even though Alex might consider herself an ordinary woman living an ordinary life, she and her life are far from ordinary. To compound matters, she doesn’t expect to fall in love with Kell or his little girls, aged 3 and 5, nor does she expect to inadvertently learn the secret of what really happened to her sister years earlier. She also doesn’t expect her stalker to escalate to the point of threatening physical violence against her or Kell and his daughters. This book was an RWA Golden Heart Finalist, which, as you can imagine, gave me an opportunity to do the happy dance a few times. Set in scenic Bend, Oregon, First Star is full of romance and suspense. 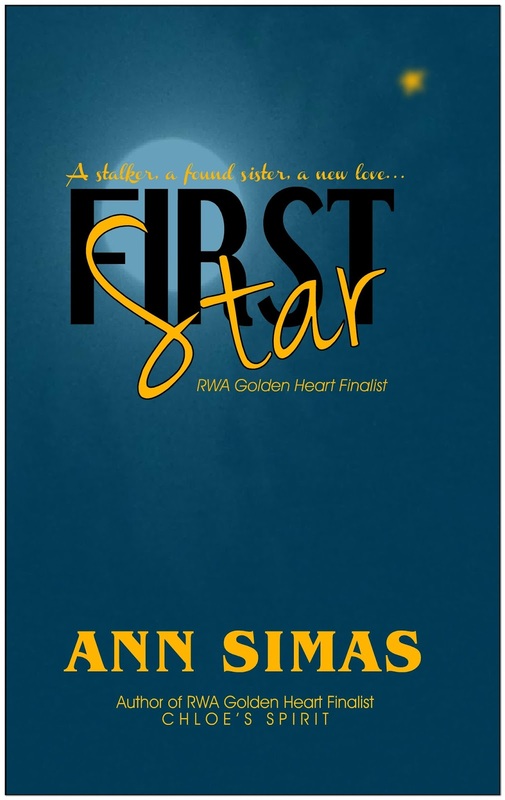 And that’s all I’m going to say, except that I’ll be giving away a copy of First Star at the end of this blog period (your choice, paperback or ebook)! I am currently working on First Star Afterstories, which is a follow-up book containing two novellas about two other couples introduced in First Star. The Afterstories will be released in Winter 2016. This is what happens when you fall in love with the secondary characters! I had the same thing happen when I wrote Chloe’s Spirit, another RWA Golden Heart Finalist. I had to write Chloe’s Spirit Afterstories. Those novellas are entitled Second Chance and Foolish Heart. Alex Dumont isn’t looking for a man, but unexpectedly she finds one at the grocery store. The problem is, as her relationship with Kell Sagen becomes more serious, so does the stalker who’s been hounding her for months. As if a new love and a mad man haven’t complicated her life enough, she learns the shocking truth about the sister her parents told her had died twenty-five years earlier. When her stalker turns violent, Alex fears for Kell’s life and the safety of his daughters. To protect them, she decides to distance herself from them. In the stalker’s eyes, is it too little, too late? Alex is about to find out. Also available on Amazon wherever Euros are spent. 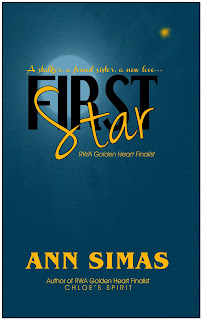 I’ll be giving away a copy of First Star at the end of this blog period (your choice, paperback or ebook)! Ann Simas lives in Oregon, but she is a Colorado girl at heart, having grown up in the Rocky Mountains. An avid word-lover since childhood, she penned her first fiction “book” in high school. She particularly likes to write a mix of mystery-thriller-suspense with a love story and paranormal/supernatural elements. The real life stalker sounds creepy enough. Looking forward to the more sinister version in the book. Mary, you're right. Real stalkers are creepy, and I did try to make my fictional version a lot more sinister, but hopefully my male protagonist, Kell Sagen, will help make up for the bad guy. In FIRST STAR, Trish, the stalker starts out creepy-but-not-really-harmful. He doesn't like that Alex, the woman he's infatuated with, hooks up with Kell, and that's when he really begins to start crossing the line between infatuation and obsession. Hope you get a chance to read the book. I'd love to hear what you think of it. Liz, there are "crazy scary" parts in the story, but I've balanced them out with the romance and heart-warming elements. First Star sounds amazing! It sure will keep readers on their toes with so much going on, which I love. I've got it on my TBR list. I would love to win it. Forgot to leave me email. Sorry. And win it you did, Jo-Anne. Congratulations! Hope you enjoy the read. Amy, I like writing books with single dads, too. Kell Sagen was especially intriguing for me to create, as were his precocious daughters. He didn't go easily into the relationship with Alex, but eventually...well, sparks do fly. My latest release, HEAVEN SENT, is another book with a single dad. There may be more. Thank you! I like to write books with lots of twists and turns, even though they take much longer to flesh out. I find them not only more challenging and more interesting, but also more fun to write.